Will cholesterol-lowering drugs prevent glaucoma progression? Rate of progression of glaucoma correlates with retrobulbar circulation and intraocular pressure. Best form of vitamin B12 for glaucoma? Before there were B-12 supplements where did all the vegans get their B-12? 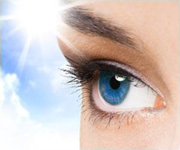 Is low vitamin-D associated with glaucoma? Optimal Vitamin D Blood Level? Monitor and Compare Our Omega-3 Indexes - Here are my results! Why is Milk Thistle included in my glaucoma supplement program? What are retinal ganglion cells? Why guess about your eye pressure when you can know? I have had my tonometer for almost 6 months. It has answered a multitude of questions about how my daily routine affects my health. I didn't know, for example, that just taking a walk outside for a half hour or so would reduce my eye pressure, sometimes by as much as 50%. I also didn't know that I wasn't one of the people whose pressures are higher at night--in fact my lowest pressures are at night. (That was good news. I was tired of sleeping with my head elevated). I have found no supplements that had any effect on lowering my IOP, but I have found that some supplements will raise my IOP quite significantly. I know that out of control thoughts and periods of stress significantly raise my IOP in spite of the two drops I am using or any other healthy lifestyle choices I am making. Read more about Why guess about your eye pressure when you can know? Most FitEyes discussion happens on our very active mailing list. If you want the latest news, subscribe to our mailing list. Does psychological stress and mental states affect eye pressures or contribute to the risk of glaucoma? Read here to find out. This is what I have discovered since applying self-tonomtery. The following is part of a conversation between Dave and a new member of the FitEyes self-tonometry research community. I am trying to take life easy but I note that the high pressures do not come down. I'd like to ask everyone with a tonometer and good eye pressure data to contribute comments to this post. What factors have we identified that affect eye pressure? I'm going to start the list informally with things that come off the top of my head. I'll revise and refine this list based on feedback from people with tonometers and good data. Thank you! The entire following blog post was intially written as a private email to a friend of mine. I decided to share it here. I grew up doing fast things in a fast way. I raced motorcycles -- and I have always loved anything fast. But I also tried to accomplish the maximum possible number of things each day and I always pushed myself to do things quicker or more efficiently. Then I developed glaucoma. As I have gotten to know myself more intimately (thanks in part to self-tonometry) I have realized that I actually like to take my time. I enjoy doing things in a non-rushed manner. You could even say that I enjoy being slow! (Something I never would have admitted to myself in my days of racing, even in my most private thoughts.) Even today, I still have a great admiration for people who do things quickly, as if this is an inherently superior way of being. When I went to get my eyes examined for a new prescription, the Dr. told me I had glaucoma. I couldn't believe it. I had so many health problems already due to stress, that I cried and cried. He said my eyes were dry and right away I figured it was from the adrenal exhaustion I suffered a couple years back, which I am on the mend from... but it is taking time. My nails, skin, hair, mouth and now eyes were dry. It is a good thing I know I am not a body. ~g~ I am a huge fan of Byron Katie and Gary Renard's contributions to the world. Login or Create an Account to start interacting with the FitEyes community. If you would like to comment on this, or anything else you have seen on FitEyes, join our mailing list (very active) or head over to our new Facebook, Tumblr or Google+ pages, or message us on Twitter.